If you are starting a business, or you need more capital to expand an existing business, you may be interested in understanding the full list of all the funding options that are available to you. 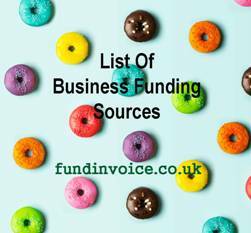 Below I have compiled a list of all the methods of funding a business in the UK. There will be many products that fit under each of these categories, however I believe the list is comprehensive at a high level, and covers all the possible options available to UK companies. Your Own Money - using your own savings. The key advantage being that your don't have to pay anything for it, you don't have to worry about repaying it and you don't have to give up any ownership. However, you have the risk of losing your own capital, and the potential loss of any interest or earnings generated from your own capital. This is of course not the case if you borrow the money personally (through say loans, overdrafts or credit cards), in order to use it for your business. In those cases you could incur charges and fees, and the prospect of not being able to repay the borrowing. Personal finance charges can also be expensive when compared with some business finance options. Read about the Alternatives To Using Your Own Capital. Equity Funding - investment of capital into your business by investors, in return for which you relinquish some part of the ownership of your business. Mezzanine Finance - a combination of both debt and equity finance. Whilst money is lent in a similar way to normal debt finance, there is an element of equity (albeit typically smaller than in option 2 above), built into the arrangement that gives the funder an additional return if the business grows. This can often offer a degree of comfort to a bank that might otherwise not be prepared to lend. Debt Funding - instead of giving up ownership you can pay a lender to borrow money from them (although an interest free loan would also fall under this category). Whilst you may pay interest or charges for this kind of capital, you don't have to relinquish any ownership, or control, of your business. Grant Funding - in some circumstances grant funding may be available to support aspects of your business. A grant is non-repayable money gifted by one party, often the Government or another large organisation, to another party. Often grants are in respect of specific aspects of your business. For example, it may be a technology related grant, or one that supports your expansion into, for example, exporting. Either way, the money doesn't need to be repaid, although there are likely to be terms attached to qualification for grants, and for disbursement of the funds. It is also often the case that this type of funding is not sufficient to meet all the requirements of an organisation, so it may not be comprehensive. Below I have continued to segment the various funding options. Equity funding is where you give some ownership away to a party that provides you with capital, you may also need to concede some element of control over your business e.g. a board seat, in some cases). Debt funding is where you borrow, often at a cost, but without conceding any ownership in your business. Investors - and private investors, whether they are people you know (family and friends) or "Angel Investors" (typically wealthy individuals, or groups, that like to invest in businesses) that put in the money. They will want a piece of the ownership of your business (and some control in some cases) in the hopes that you make it a big success and they benefit at some point in the future. They may also require dividends along the way. You could also place public flotation under this banner, whereby you offer shares in your business for public sale. This kind of capital from investors may avoid the need for you to make regular repayments, as you would for say a loan, but you lose part of the ownership of your business - and your investors may also expect regular dividends. There are also crowdfunding organisations that can offer you this type of investment money (raised from a large number of investors), in return for a stake in your enterprise. The issues over conceding control remain the same. Venture Capital - or VC money is similar to having investors, however Venture Capitalists tend to be large companies, that make numerous investments in the hope that some will yield high returns. They will tend to demand high returns, so it is sometimes difficult to qualify for this type of capital investment. Even if you get the funding at 0% interest (interest free), its still considered "debt funding" as you have to repay the capital sum. Normally however, you will also have to pay a margin to compensate the lender, and possibly other fees to secure this kind of finance for your business. However the biggest advantage is that you don't have to give up any ownership, or control of your business. Family and Friends - one of the simplest ways to borrow is from either your family or your friends. They may even provide the money on an interest free basis, which means you have no cost of funds. However, you are then risking the money of the people you know, and it could be very awkward if you end up losing their life savings, should your venture fail. Trade Credit - another simple method of funding your business is to take trade credit from your suppliers. If you don't have to pay for your supplies of say raw materials for 30 days, you have an opportunity to sell the final product (and maybe get paid on cash terms) before you have to pay your suppliers. Even if you can't fully complete your sales cycle within the period of credit, this type of credit will reduce the amount you may need to raise from other sources. Typically there is no obvious cost for this kind of credit, however, you may lose out on a discount for paying cash up front if you take credit from your suppliers. Also, not all suppliers will grant credit to all of their customers, and many will want to credit check your business before they will agree to offer you an credit account. Similarly, long credit periods are not common. Typically credit periods of 30 days - maybe 60 days in some cases, are granted in the UK. Overdraft - another well know means of financing whereby your bank allows you to go overdrawn on your current account, by an agreed amount. Charges such as bank overdraft interest, and other renewal fees are typically agreed upfront. However, banks have become increasingly careful about who they will lend to, so many customers struggle to access enough of this kind of funding to meet their working capital needs. This has led to the rise of the "alternative finance" market, where non bank lenders offer loans and other forms of ABL and receivables finance in order to support businesses that can't qualify for bank finance. Business Loans - again this type of finance is well known. With a business loan you borrow a set amount, from a bank or other funder, over a set term. P2P (Peer to Peer) loans are also increasingly common whereby you borrow form one or more businesses, your "peers". You typically make regular repayments (or a single repayment in the case of say bridging loans) throughout the term of the loan resulting in your debt, and the interest and charges having been repaid in full at the end of the term. Asset Based Lending (ABL) - means leveraging the assets of your business to raise the finance. This could include property, plant, equipment and machinery, stock & work in progress and your accounts receivable (money owed by debtors). A core aspect of ABL is often what we refer to as "receivables financing", using your book debts to secure the finance, but ABL will also take other assets into account in arriving at the total amount of funding to be offered.. Receivables Finance - this type of funding uses the debts owed to your business, by your customers, as security. It can be used on a standalone basis, or as part of an ABL package of funding as described above. The funding can be raised against invoices and is often called invoice finance, factoring or invoice discounting. For more information see our Invoice Finance Guide. In the case of say a construction sector company, applications for payment are funded - where they are used instead of sales invoices by almost three quarters of construction sector organisations. Asset Finance - assets such as plant, machinery or equipment are purchased via finance over an agreed time period. The finance is secured against that asset. Again this can be on a standalone basis, or as part of an ABL package of funding. This type of finance can include leasing and hire purchase. Crowdfunding - has become popular in recent years. The principle being that the business raises funding from a large number of entities (which could be individuals or other businesses - that between them form the "crowd") that each contribute a small amount of the overall sum financed. Typically, one of the large number of Internet based crowdfunding platforms is used to organise the transaction. Company Credit Card - another well known option, you can take out a credit card for you business and either use it to make purchases on credit repayment terms, or you can sometimes draw down a lump sum cash advance. This will be subject to interest (which can be expensive) and possible other charges. Fuel cards operate in a similar way for the purchase of just fuel. Trade Finance - is a credit facility whereby a lender pays your supplier, for a shipment of goods or raw materials, whilst allowing you a period of time to repay the advance. This can allow you to process, sell, and get paid for the goods, before you have to repay the purchase price. In some cases trade finance can be coupled with invoice finance, such that the invoice finance repays the trade finance. When the debtors finally pay, they repay the invoice finance facility completing the cycle. Merchant Cash Advance - a fairly new service for businesses that sell via a card machine (PDQ terminal). The funder will advance a set amount of money, based on your PDQ machine takings, that will be recovered from an agreed percentage of your card machine takings over time. There will be a charge for using the service. Supply Chain Finance - is similar to receivables finance (see above). The difference is that the facility for each supplier falls under a master arrangement between the debtor and the funder (where the debtor is a very large business). With supply chain finance, the suppliers benefit from the stature of their debtor, and can often access cheaper funding rates than they would be eligible for if it were based on their own credit standing.